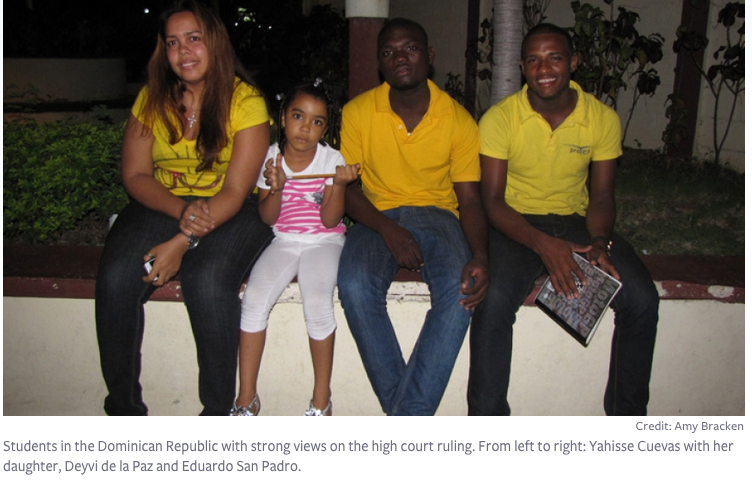 You may be familiar with a controversial court ruling in the Dominican Republic that retroactively stripped citizenship from anyone born in the country to undocumented parents dating back to 1929. Not surprisingly, it mostly affects Dominicans of Haitian descent. Public Radio International‘s “The World“ sent reporter Amy Bracken to the Dominican Republic to interview folks on the island, and much like the immigration debate here in the United States, opinions were mixed. When Bracken asked Cuevos if he thinks it’s unfair to make people who have lived in this country for generations go back and apply for papers all over again, he said “no,” since most of those affected have ties to Haiti. “According to the Haitian Constitution, anyone of Haitian descent, whether legal or illegal, living in any country, is Haitian. That’s what their Constitution says,” Cuevos said. On the other hand, high school student Yahisse Cuevas saw things a different way. It is no secret that many Latin American countries have attitudes against those with darker skin. One has to wonder how much that plays a factor in this debate. Listen to the interesting audio here. And catch their other segments via their archives. The World is a great show to keep more in-depth tabs on news from around the world.